Oddball Stocks: Homasote: is it cheap or bankrupt? The housing bulls are back; the housing bears are back. This stock is a rarity that will satisfy both housing bulls and bears. The stock a study in shareholder destruction, the power of a successful turnaround, and lastly the legitimacy of operating leases. Homasote is a well known brand, they manufacture building materials and have been doing so for over 100 years. The company is very proud of their history, each annual report contains pictures of the company's products from the 1930s and 1940s, the latest has a copy of their original patent included. The company touts itself as America's leading green building products manufacturer. All of their products are manufactured with Homasote board which is 98% recycled paper fiber and 2% other materials, which they promise are natural and environmentally friendly. The company consists of two divisions, a millboard division and an industrial division. The industrial division is the smaller of the two and creates items for product separation and breakage reduction. The company's millboard division manufactures everything from sound insulation to concrete joint filler to forming board (Homex) to roof decking. They even manufacture Ice Deck, a covering for ice arenas. One would think that a company heavily levered to the housing market would have reported enormous profits in the early part of the last decade. Instead the company has reported losses as far back as the eye can see. The company's last profit before 2012 was 11 years earlier in 2001 when they earned $4.46 per share. At that point they also had a book value of $24.91 per share. For the next 11 years the company consistently lost money, not small sums either, they routinely lost $1.5-2m a year on $18-20m of sales. The astute reader will notice two things, the first is that the company's book value is a negative $14.73, meaning in 11 years the company had been able to destroy $39.64 worth of shareholder value. The second thing the reader will notice is that they earned $2.31 last year, and are trading for $4, for a trailing P/E of 1.73. On the basis of their trailing earnings the company is extremely cheap. Investors priced the company for death, shares traded down to $.25 a share in 2011, for the 166 stock holders of record it's been a wild ride since then. Anyone crazy enough to buy at the low has a 16 bagger at these levels. Yet if Homasote is somehow able to sustain their turnaround the shares look cheap even now, at least when looking at earnings. 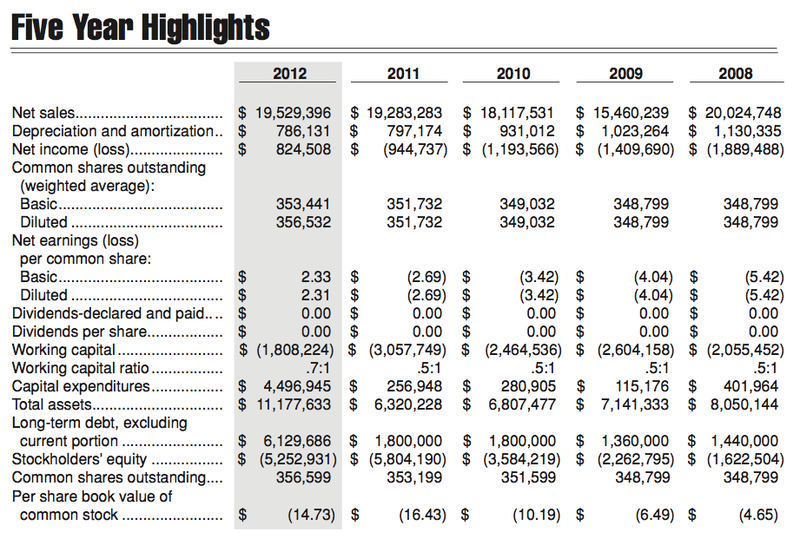 Before moving into the balance sheet, it's worth looking at what the company did to earn their profit this past year. They were not profitable due to record sales, rather they reduced their cost of goods sold. The company signaled last year that they're working on two initiatives, reducing energy usage, and selling to markets that need their products. It seems like a no-brainer to sell products to people who need them, but you'd be surprised at how many businesses do not do this. Once the company completes their energy usage improvements it's likely COGS will be reduced again, and profits could potentially be sustainable. It's also worth noting that the company has a very small float, which means that each additional dollar of profit will result in a substantial gain in earnings per share. For example, if the company is able to reduce COGS by 5% through their energy investments EPS would almost double to $4.23 a share. While the company's income statement has improved over the last year the same thing can't be said about the balance sheet. When I'm looking at a highly risky turnaround investment I want a considerable margin of safety to exist with the company's assets. If the turnaround fails and the company has no assets what's left for the investor? Usually a tax deduction and a memory that's hard to suppress. Homasote's assets are what you'd expect for a manufacturing company, some cash, receivables, inventory and a lot of property, plant and equipment. The company's PP&E came at a cost of $47m and has been depreciated down to $7m. Maybe the silver lining is there is some hidden asset value in their real estate or buildings. The assets aren't the issue for Homasote, it's their liabilities. The company has $8.13m in long term debt obligations as well as a $4.1m pension benefit obligation. Both the debt and pension obligations are onerous, last year interest expense alone was $466k, or 37% of their operating income. On the pension, the expectations are a bit high, the company expects the pension to return 8.5% a year on a 70/30 portfolio. When I looked at the company's financials for the past year something caught my eye that I couldn't reconcile with the financial statements alone. The company's long term debt went from $1.8m to over $6m in a year. Normally this would be associated with a debt issuance, and as the company's debt account increased their cash account increase to keep the statement in balance. This wasn't the case, initially I couldn't figure out what changed outside of the increase in debt. Furthering the mystery there was no mention of proceeds from financing in the cash flow statement that matched the increase in debt. The answer was found in the notes, up until last year the company had an operating lease with Caterpillar for machinery at their factory. For reasons not discussed in the annual report Caterpillar decided to terminate the operating lease and convert it into long term debt. Suddenly the off balance sheet operating leases appeared on balance sheet, and the company's financial situation looks much worse. The reality is nothing has changed between this year and last year, it's just that the debt that was hidden is now visible and sits on the balance sheet. For the curious the company increased their PP&E account to reflect that the leased machinery was now owned. There's a lot of debate and discussion about whether operating leases should be considered debt. There are great arguments on both sides, but seeing what happened to Homasote makes the debate tangible. The lessor decided at their discretion to change the terms of the lease, canceling it and turning it into long term debt. Because the company relies on this machinery to manufacture their product they had no choice but to go along with Caterpillar's decision. Homasote isn't the type of turnaround I'm willing to get involved with. There is no margin of safety in this stock. The price is cheap, but there is nothing to fall back on if they hit hard times again. Looking at their history it's not a question of if they'll hit hard times, but when will they hit them next? Maybe the company's changes to become profitable are sustainable and they will earn out their deficit. If they can do this it wouldn't surprise me to see the stock soar. But it's just as likely to end up in the bankruptcy courts as well. 1. If a company cannot ride a rising tide, I would be suspicious of its ability to ride a low to ebbing tide if there is no significant change in strategy, vision, management etc. 2. I've realized that - unless there is a genuine change in the vision and execution, companies that are used to slack are used to slack. It is human nature to resist change - when was the last time a person driving a car switched to public transport completely on his own volition barring a few ? As an aside, it would be good if you do a post on the "process" itself - how you find out the operating lease to long term debt etc. It will help us understand how to dig for information. That framework, often may be much much more invaluable than the end result itself ! The process I go through isn't much of a process at all. I simply read the financials and try to make sense of them. All three statements should act in concert, so if there is a value in one statement that isn't supported by the others that's a pointer to look into it deeper. First make sure everything matches, then second question the reasonable-ness of the statements. You'll end up weeding out a lot of companies if you do this. What do you think about investing in countries like Japan, Greece, and Spain. These countries are having difficult timesWould you recommend investing in countries such as Greece, Spain etc? The thesis being is that all the problems are reflected onto the market price and you can pick some super cheap companies. You have ventured into Japan, would you recommend the value investor to go hunt some Japanese companies? Greek? Spanish? I'd love to hear your insight on this. There is a lot of value in investing in depressed places, the key is to make sure a reasonable margin of safety exists. I've looked some at Greece, maybe a half dozen names or so. The common denominator is that all of the companies are heavily in debt. Debt is something to be avoided, especially in distressed names. I haven't looked at Spain as much, I should put it on my list. Any good names that come to mind? I've investigated Greece a bit myself, and have not been able to find a whole lot. HOWEVER, I did find ONE thing worth investing in..."Greek Organization of Football Prognostics (OPAP)". It trades in the USA as GOFPY. I've owned it for a while, and have done nicely. I've got a capital gain and some dividends. If Greece ever comes back, I think this stock will do well. I also think it one of the VERY best companies to own in Greece. They've solidly made money throughout the downturn, they have also managed to pay a decent dividend also.